exceptionally clean. The pool area includes two baby pools and two olympic size pools. lounge chairs,tables and umbrellas for those who need the shade. The condo has recently been remodeled.We have Wifi,Cable two T.V's and two airconditioners ,plus a washer and dryer WE have two patios and .Special rates for long term rentals. The master bedroom has it 's own bathroom with a new walk in shower. The shower is easily used by any one who is disabled.The living area has has an awning over the patio and a table and chairs for outdoor dining.We eat breakfast overlooking the ocean an the pool every morning. The Master bedroom has a patio and two new lounge chairs for our guests enjoyment. the traveler to do there,Deep sea fishing, swimming,surfing,sailing,wind surfing, banana ski boats , boats for water skiing, jet skiing boats and Parachuting. There is a wonderful water park with many great attractions including a slide that is thrilling. Of course the swimming beach right in front of the building is lovely and the water is warm and refreshing. Bunge Jumping is also available not far from the building. Patio has table that seats four. Large one bedroom beachfront condo with two bathrooms.On the beach with two large pools for your enjoyment. Two large balconies offer spectacular views of the ocean and the bay. The condo accomodates up to four people. There are two color t.v. 's, 2 vcr's air conditioning and a cd player. The housekeper Rosie, will cook and clean for you. She will also do your laundry in the condo which has a washer and dryer. For a nominal fee babysitting can be arranged with Rosie. She is able to babysit during the day and night. You are within walking distance to restaurants,shops,markets and a golf and tennis club across the street. A vacation to remember!! The best condo in Mexico I have been in. It was one of the finest I have stay in. The maid, the condo everything about it. Location location the best. On the beach, great resturants, golf, tennis etc walking distance. Would recomendé to everyone. Wow!! Couldn't ask for a better vacation!!! .Everything was Super!! The condo had been recently remodeled very comfortable Clean and attractive. The building and the grounds are very well kept as are the two Olympic size pools..After an enjoyable breakfast on the canopied patio overlooking the beautiful ocean we rushed down to the beach for a fantastic day of swimming and taking advantage of the many water sports available.The housekeeper who comes in everyday for a nominal fee will cook for you. She is great cook!! We are looking forward to coming back in the near future. Thank you so much for the wonderful review. You were wonderful guests and we do hope you will return. I have stayed at this location twice before and am planning a third visit in a few weeks. The condo is located on a private beach and in the center of shops, restaurants and nightlife. The staff is amazingly helpful and speak English. There are two pools, a private beach, amazing views. It is a peaceful and relaxing place to stay and recharge. I highly recommend a visit here!! I returned to breathtaking Acapulco after 15 yrs of visiting other places around the globe. So that you know, I am a seasoned traveller. But am I ever happy that I heeded the pull on my heart strings to return. The complex is even more beautiful and impeccably maintained than way back when. I was enthralled once again. I rented this particular condo because it is decorated so stylishly as to complement the incredible view. The one bedroom is spacious and airy. The living room and bar area are wonderfully open and give a feeling of much more space because of the mirrored wall. It comes with the sweet housekeeper Rosie who keeps the place immaculate. My only issue was getting in and out of the bathtub in the master suite area-a bit of a steep step into a deep tub. But there is another bathroom with a walk in shower so it is fine. 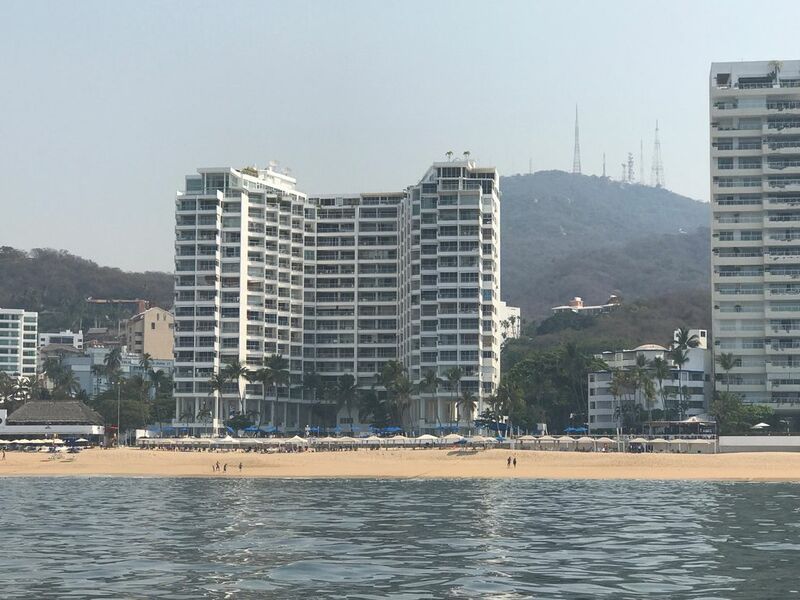 Both of the balconies provide gorgeous views overlooking Acapulco Bay. Many an evening was spent sipping wine with dinner as the sun set in all it's' glory. But, Acapulco is lively and going out to the spectacular restaurants is a must. The pool(s) are the highlight during the day. The clientele, both owners and renters are friendly and helpful. There is a restaurant next door that has a bell on the perimeter of the complex that u can ring to get a cocktail delivered to you anytime. A fun touch. The staff of the complex, both poolside and at the lobby entrance are vigilant and will treat you like royalty. All in all, this vacation, this complex and the condo are a win-win. You will love it here!!! We cannot say enough about this stay in Acapulco. From the time we stepped out of the taxi, the staff was accomadating. The building and common areas are immaculate, the pool area, immaculate. The condo was the same, immaculate. Rosey the housekeeper is a gem. We loved her. She couldn't do enough for us. The pool area is quiet, never crowded. No need to get up early to save chairs as there is always plenty of room. We enjoyed the Tabascco Beach restaurant next door for breakfast, lunch and dinner. This condo is centrally located for us. The doormen will get you a taxi and put you on your way!! Being our 30th year going to Acapulco, we have to say, this is the nicest condo building we have ever rented. We will be renting again!!! life for those who love to dance and just have fun!! Nightly Rate: $75 - $185 Weekly Rate: $525 - $1050 Monthly Rate: $0 - $0 Long term rates are negotiable. Flexible rental rates depending on time of year and number of people. Inquire.